An Evanston Police Department squad car. Officers at the school are now equipped with body cameras, per an intergovernmental agreement between District 202 and the Evanston City Council. Student resource police officers at Evanston Township High School are now equipped with body cameras, according to a February intergovernmental agreement between the ETHS/District 202 School Board and the Evanston City Council. The agreement stipulates that the two uniformed officers assigned to ETHS are only permitted to turn on their body cameras when they determine a crime is being committed or a situation has become hostile. District 202 wanted to set parameters for body camera use in the building, Superintendent Eric Witherspoon said. 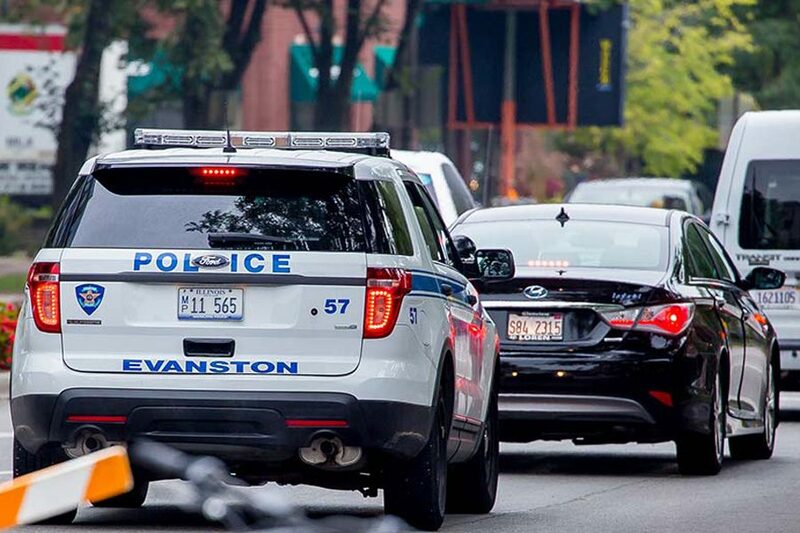 After an Illinois law passed in 2016 mandating that all police officers use body cameras, the Evanston Police Department equipped all their uniformed officers and detectives with the devices in January 2018. These school resource officers are on-duty officers assigned to ETHS by the EPD. They are typically on-assignment at the school for an extended period of time, rather than rotating day-to-day, and are present during the full school day, Witherspoon said. Witherspoon emphasized that the cameras are not routinely recording at the school. Per the agreement, student resource officers are required to notify the principal as soon they decide to turn on their body cameras. Any film gathered by student resource officers would be considered a police record, not a public record, Witherspoon said. Illinois law restricts viewing of camera recordings to people who are responsible for retracting, labeling or duplicating the file. It also states that recordings must be destroyed after 90 days, though some exceptions apply. EPD Cmdr. Ryan Glew said he doesn’t foresee the use of body cameras changing anything about how officers police schools like ETHS. “They should not be obstacles for the officers doing their jobs or hindrances,” Glew said. These body cameras also capture audio, Glew said, which can help increase transparency of a hostile or criminal situation at a school. Karen Sheley (Weinberg ’99) is the director of the ACLU Illinois Police Practices Project, which works to litigate police accountability, and said the organization opposes using body cameras in schools. The decision signifies that officers will be in schools far more often than is necessary, Sheley said. Sheley said officers should only enter schools in times of emergency, and at that time using a body camera may be appropriate. However, an increased police presence at schools further develops the school-to-prison pipeline, she said. Body cameras undermine student privacy and freedom of association, Sheley said, because students know they might be on camera. The ACLU Illinois hopes that parents and students will voice their concerns to administrators to oppose this agreement, Sheley said. Witherspoon said he doesn’t see the introduction of body cameras at ETHS as an invasion of privacy. ETHS allows the use of cell phones for academic purposes, though it restricts their use “in any manner that disrupts the educational environment or violates the rights of others,” according to the 2018 student handbook. Students must also follow the instructions of teachers and staff regarding phone usage. Witherspoon added that the student resource officers placed at ETHS usually do not change day-to-day, giving them the opportunity to build a relationship with students and staff while learning the school’s culture.